When I first joined ATA back in 2003, I knew it was the organization to join if I wanted to be serious about my language career in the United States. But the truth is I did not know exactly why. During the fall of 2002 I had had the opportunity to attend my very first ATA Annual Conference as an employee of a language company. The 43rd ATA Annual Conference in Atlanta, Georgia, was an extraordinary experience, though at the time, as a representative of an LSP, my role and interests were different, and I did not take advantage of many opportunities during the conference simply because I was not an independent contractor. Nevertheless, it provided a great opportunity to learn more about the organization, and this experience is what ultimately led me to become a member the following year when I was no longer working with the LSP. Had I not had that experience in 2002, perhaps it would have taken me longer to join ATA, because I didn’t know much about it. This is one of the challenges of being a new freelancer: Because we are independent contractors, we depend heavily in the networks we develop, we need to look for information as it is not handed out to us, and we must be very active and involved to stay current with trends, software, etc. An excellent way of accomplishing this is by joining a professional association. In the United States, ATA, its chapters and divisions, are, without a doubt, the main associations for language professionals. ATA was founded to advance the translation and interpreting professions and foster the professional development of translators and interpreters. Its 10,500 members in more than 90 countries include translators, interpreters, teachers, project managers, web and software developers, language company owners, hospitals, universities, and government agencies. 1) Annual Conference. The ATA Annual Conference is held every fall in a major U.S. city. The conference features more than 150 educational sessions, an Exhibit Hall, and numerous networking events. 2) Certification. ATA offers a certification exam to translators in 26 language combinations. Becoming ATA certified allows translators to objectively document their abilities in specific language combinations. 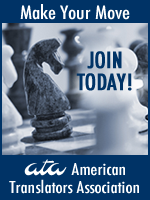 To me, earning ATA certification marked an enormous difference in my career. Almost 70% of all new contacts/business find me through the ATA directory because my name stands out with the magic words “ATA Certified” next to it. 3) Professional Development. The Association offers monthly webinars to provide education in diverse specialties and languages at all skill levels. 4) Honors and Awards. To encourage, reward, and publicize outstanding work done by both seasoned professionals and students of the craft, ATA presents several awards and scholarships during the Annual Conference. 5) Divisions. Through 18 specialty- and language-specific divisions, ATA provides ways for members with common interests to network more effectively. Divisions organize formal and informal networking events at the ATA Annual Conference and offer blogs, online discussion forums, and social communities such as Facebook and LinkedIn. 6) Local Groups. ATA chapters and affiliates provide local translators and interpreters with regional information, marketing, networking, and support. 7) Client Education. The Association has developed publications to educate consumers about translation and interpreting services and the value that professionals bring to the project or job. Another interesting fact is that ATA is a member of the Fédération Internationale des Traducteurs (FIT). As you work your way toward becoming a professional linguist, I encourage you to look into the multiple and priceless benefits that ATA, its local chapters and divisions have to offer to both newcomers and seasoned professionals alike.